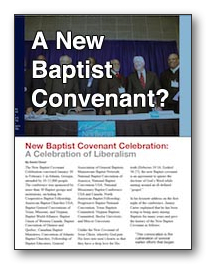 A report on the "New Baptist Covenant Celebration" conference held Jan. 30th to Feb 1st, 2008, in Atlanta, Georgia. This conference was sponsored by more than 30 Baptist groups and institutions and was attended by ten to twelve thousand people. Keynote speakers included Bill Clinton, Jimmy Carter (main personality behind the New Baptist Covenant,) Tony Campolo, Bill Shaw, William Underwood, John Grisham, Marian Edelman, and others. Al Gore presided over a "Stewardship of the Earth" luncheon at the conference and Jimmy Carter was introduced as the husband of the world's most famous female Baptist deacon, referring to his wife Rosalynn. A main message was given by Julie Pennington-Russell, pastor of First Baptist Church, Decatur Georgia.